be the consequence of withholding an emetic: but this has its rise in the stomach; the pain commences there, by reason of acculated sharp crudities, that irritate the region of the stomach, and by-and-by a sympathy strikes the sides: the doctor is called to a pleurisy; he lets blood, but to no essential purpose; it must abate the sympathy in the sides, but cannot affect the cause. In one case of this description, I was called; but all means were baffled, even the electric shock would only abate the sympathy in the sides for a few minutes; but as soon as a puke began to operate, the whole disturbance subsided. I have known but of one other case just similar: A doctor was called, at a late stage: he drew blood for a pleurisy; it availed nothing; the person expired in great agony in a few hours after bleeding. This disease is attended with a total suppression of perspiration, equal to any retension in fever heat. 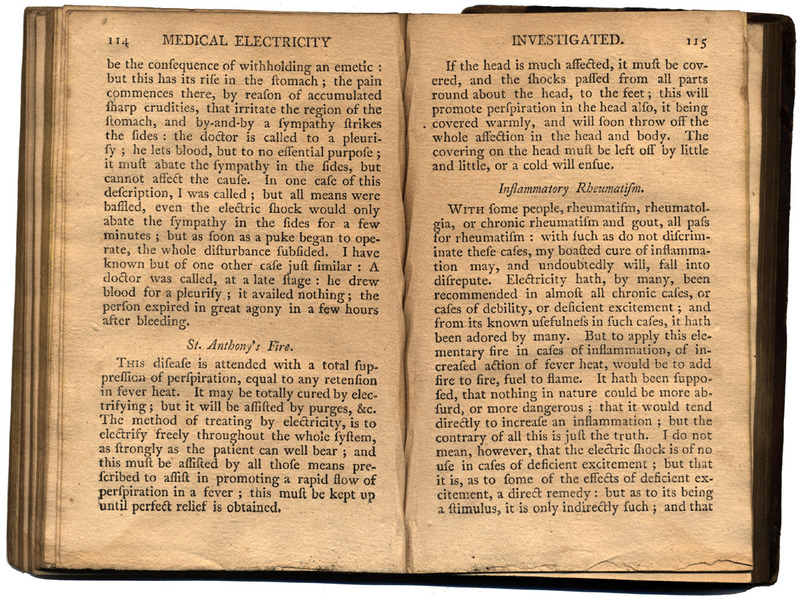 It may be totally cured by electrifying; but it will be assisted by purges, &c. The method of treating by electricity, is to electrify freely throughout the whole system, as strongly as the patient can well bear; and this must be assisted by all those means prescribed to assist in promoting a rapid flow of perspiration in a fever; this must be kept up until perfect relief is obtained. If the head is much affected, it must be covered, and the shocks passed from all parts round about the head, to the feet; this will promote perspiration in the head also, it being covered warmly, and will soon throw off the whole affection in the head and body. The covering on the head must be left off by little and little, or a cold will ensue. 15<?b> Chapter 1 - Electric fire promotes the vegetable life, etc. 153 Palsy 197 Film 232 Wounds, etc. Electricity, or Ethereal Fire, Considered is presented here for historical purposes only, and should not be interpreted as medical advice.